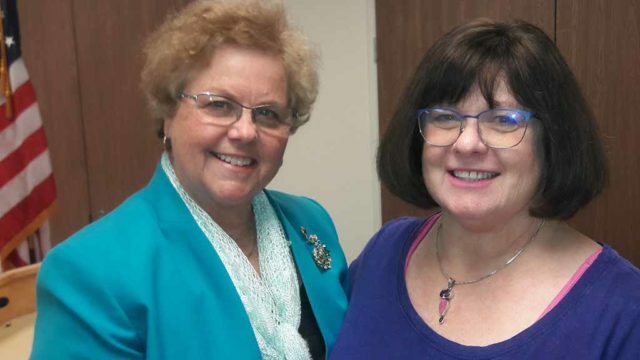 The Democratic Woman’s Club of San Diego failed recently to get labor leader Mickey Kasparian kicked off the local party’s Central Committee. In a letter dated March 17, club officers led by founder and president Susan Peinado again called on the 170 Central Committee members to remove Kasparian as a delegate to the state Democratic convention in mid-May. 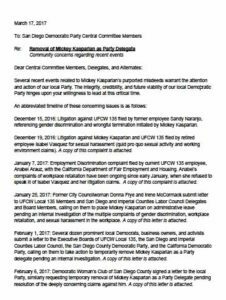 “Given the ongoing litigation and serious nature of the claims against him, his presence there would be distracting at best, and could impugn our local party’s reputation at worst,” said the letter, which recounts the history of current and former female UFCW employees accusations against him. Allegations against Kasparian undermine the party’s ability to “maintain a resolute and clear message to the public that our values are real and not just rhetoric,” said the letter, part of a 22-page document. Besides Peinado, signatories are vice president Ramla Sahid, treasurer Christa Wubbolding, secretary Rebecca Fielding-Miller and past president Emily Bonner. The five hope the Central Committee takes up the issue at its 7 p.m. meeting Tuesday at the IBEW Union Hall in Kearny Mesa. “We ask that you consider appropriate action given the severity of the nature of these claims and the impact to our party,” the letter says. “To the women who have come forward with claims about Mr. Kasparian, and to others who have raised their voices in support, please know this: We hear you. I have been a woman in the workforce, in business, and in politics long enough to know how difficult situations like this can be,” Hayes said. “The San Diego County Democratic Party is an organization governed by bylaws, which include criminal conviction as a cause for removal, but not alleged behavior. Our Executive Board’s decision not to pursue Mr. Kasparian’s removal was based on our written rules. The March 17 letter includes a chronology that notes a Feb. 27 meeting between the Woman’s Club and the party’s Credentials Committee. But on March 7, according to the letter, the party’s executive board decided against taking action on a Woman’s Club request to end the UFCW Local 135 and labor council president’s local party role. The club said it sent the latest letter to ensure that Central Committee had certain information. “Firstly, Mr. Kasparian’s political power in the region, throughout the state, and nationally potentially insulates him from the consequences of his purported actions,” said the letter obtained by Times of San Diego. “Secondly, as someone who derives a good deal of his political influence from his role in local Democratic politics, we believe it is crucial for members of the San Diego County Democratic Party Central Committee to be well-informed and able to have a critical conversation regarding the prudence of such an individual bearing any sort of representational title or role on behalf of our local party. The local Democratic Party calendar summarizes the role of the Central Committee. “Our Central Committee is the governing body of the county Democratic Party as defined in the California Government Code and Elections Code. It is comprised of local Democrats elected by voters in each Assembly District as well as partisan-level Democratic elected officials and nominees.